My goodness! It's getting harder and harder for me to choose posts of the week because the students in Room 19 are just pumping out some jolly good posts. 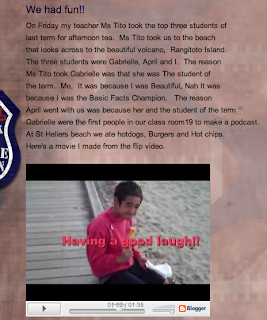 I have chosen Feki's post 'We had fun' because his writing to support the video was a good example of an effective paragraph. That's what we have been practising during our writing sessions. Well Done Feki. They also had to think about what they would do differently next time, how they could use 'new' information/knowledge in real life situations or future classroom situations, were they given enough time to complete their DLO? Keep an eye out for their new 'full reflection' posts where each student will individually answer each reflection question. Tracey, Feki, Mauina, Vaha and Ngaina. The Pukeko reading group had such a great term last term. I can see they are rearing to go for gold again this term. Here's a movie put together by Mrs Clarke - the students read the story 'The Mud Slide', wrote a script together, were given parts to read and were recorded for you to enjoy. If you wish to give them feedback please go to their individual blogs and leave comments. 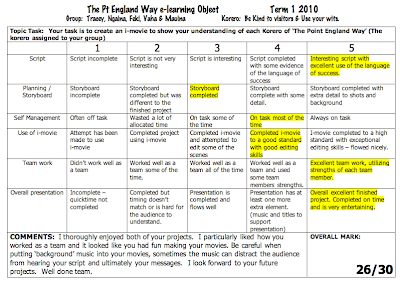 DLO of the Term- The Pt England Way Korero. Last term the students were asked to make movies showing their understanding of some of the korero that helps our students remember the 'Pt England Way'. Students worked in groups and were assessed on a number of things. The post you are about to see is the 'top' DLO of the class. 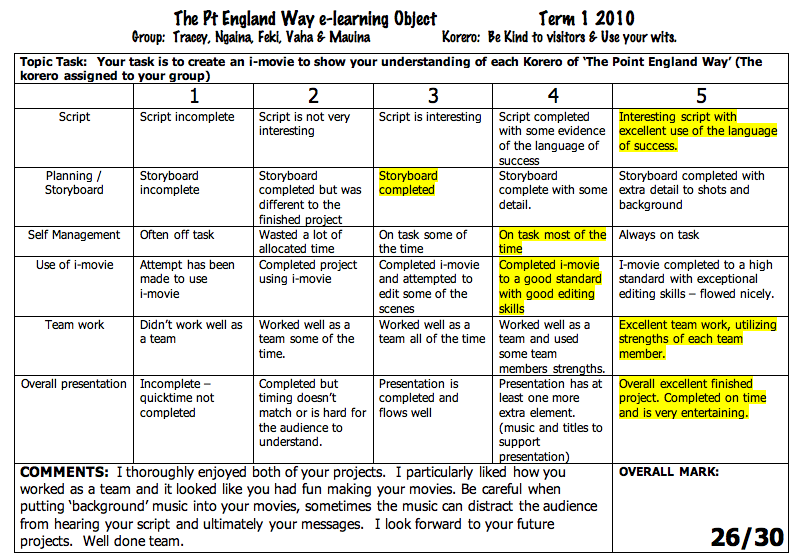 If you check the rubric (above), you will see their final assessment. Well done Tracey, Feki, Mauina, Vaha and Ngaina. All your hard work paid off.